It is Never Too Late to Make Music! Do you ever listen to a concert and wish you could play a band or orchestra instrument? Do you already play an instrument, but find yourself wishing you played a different instrument? Have you recently started playing a band or orchestra instrument but haven't had any place to play with others? Have you ever thought back on how much fun it was to play that instrument you played many years (decades!) ago and wish you could do it again? Do you watch your kids play in band or orchestra and think that it really looks like fun? Do you want to play your instrument, but don't want the stress of the standard community band or orchestra? Ever think, "I play a bit, but I'm not quite ready"? If so, we are the music group for you! After our regular rehearsal, we have a swing band and a woodwind choir, both of which meet from 8:15-9:00. No auditions necessary. Come play with us! Explore our site to learn more and feel free to just come and listen or sit in for a week or two to see if SVNHM is the place for you. We rehearse at Wayland Middle School on Wednesday evenings. Most people arrive between 6:15-6:30 for the evening rehearsal and rehearsal runs until 8:15. Our swing band and woodwind choir rehearse from 8:15-9:00, after Wednesday's rehearsals. 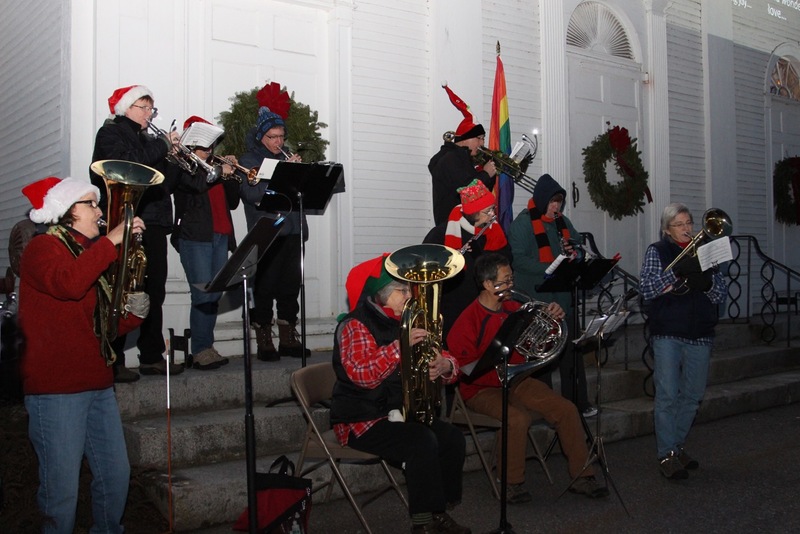 For the band, there is also a band rehearsal on Monday afternoons place at the Wayland Town Building (see the Daytime Rehearsal page for more info). Check our calendar link for when we are rehearsing. Email Diane for more info on any of the above. Wednesday evening rehearsals are at Wayland Middle School, 201 Main Street, in the cafeteria. Come in the front door, turn right and come to the cafeteria. Monday afternoon band rehearsals are at the Wayland Town Building. Email Diane for more info. I want to learn piano (guitar, uke, bass guitar, dulcimer...). Sorry, we do not teach anything except string orchestra and concert band instruments. Email Diane and she may be able to help you find a teacher on the other instruments. The North Bridge Magazine editor, Keri Lyman, came out to one of our rehearsals, interviewed some members and wrote a terrific article about SVNHM for the Spring/Summer 2015 magazine. North Bridge Magazine goes out to all residents in Acton, Concord, Carlisle, Lincoln, Sudbury and Wayland. Follow the link to read the article. ABC clip about New Horizons Orchestra in Mesa, AZ. NPR article on the New Horizons International Music movement! ...is just about over. Our Spring Concert with all of our groups (String Ensemble, Band, Swing Band, Woodwind Choir) will be Saturday, May 4, 3:00 at Wayland Middle School. What about fall session; will YOU be playing?? Who? Beginner class, novice, returnees, intermediate players, and advanced players who are too busy to attend the rigid rehearsal sechedule of a regular community band. For more information, contact Diane. All sessions (except where noted) are Wednesday nights, 6:30-8:15, for a cost of $80 for all 6, or $20 a time, drop-in fee. Rehearsal places below (mostly NOT at the middle school). Click on the correct link below for a registration form. 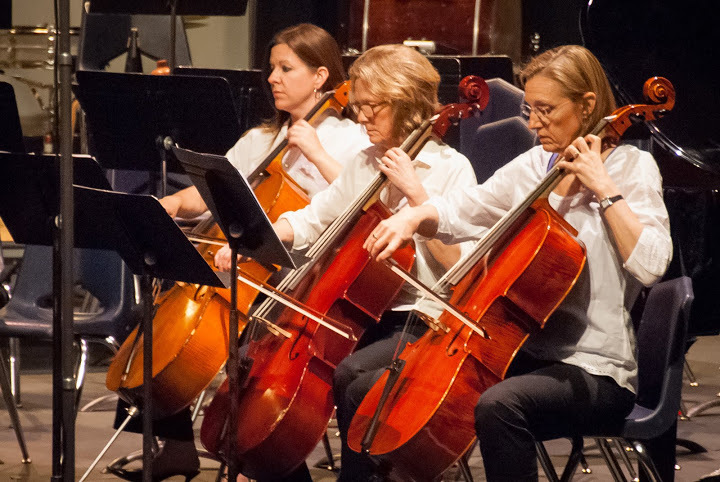 STRINGS will have their summer session on Wednesday evenings, May 15 - June 19, ending with a performance at a senior living facility (Traditions?). A brass ensemble will rehearse after our regular rehearsals again this year: May 15, June 12 & 19. Movie Night, co-sponsored by the Wayland COA, will be February 1, 7:00 at the Wayland Town Building COA room. This session, we watched the Leonard Bernstein musical, On the Town. This was Mr. Bernstein's first Broadway musical and grew out of the ballet Fancy Free (both works by Bernstein and Jerome Robbins). As a new event for the February vacation week (when we can't rehearse at the middle school), we will have a "Works-In-Progress" Work Session, a.k.a Non-Master Class. Five indivduals or small ensembles will be our guinea pigs and play parts of a work in progress to be coached by either Diane or Linda. Audience members and those playing should go home with lots of new practice tips and hints for solving their musical problems. Wednesday February 20, 7:00pm at the Wayland Town Building, Large Hearing Room. 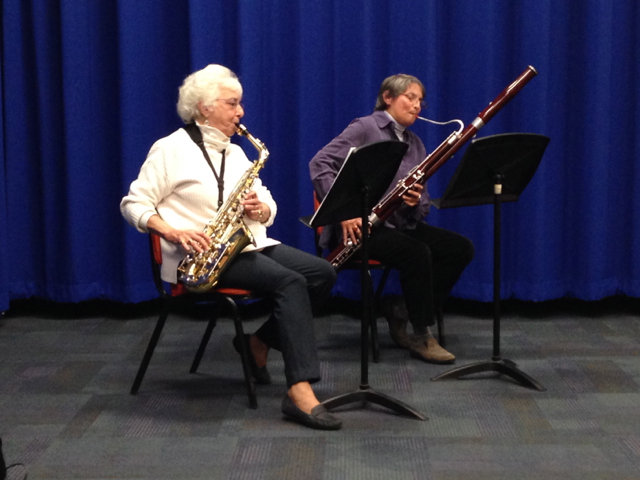 In the spring, one Soirée Musicale is never enough for all who wish to play, so we will have two in March, Thursday, March 7, 7:30 at the Wayland Town Building, Large Hearing Room (co-sponsored by the Wayland COA), and then Sunday, March 10, 3:00 at First Parish Wayland, as part of the First Parish March events. 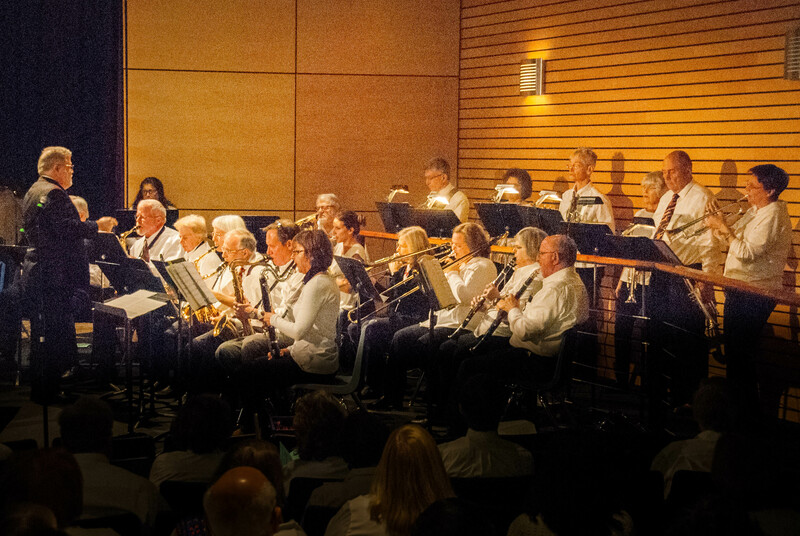 Our Soirées are a time where many of our members share the music they have been practicing. Audience members are welcome; these are relaxed, informal events. SVNHM hosted March Music Madness (March 30) a festival for New England New Horizons music groups. Members of 10 other New Horizons groups joined us (140 participants!) and we had band and string members taking part in small ensembles in the morning, then a large string ensemble with some winds added, a beginner/novice band, anintermediate band and an advanced band in the afternoon. The festival will took place at Wayland Middle School. There was no concert per se, but we played for each other at the end..
That group had so much fun that some of us decided to share our music at Sunrise Wayland Assisted Living where we played and they sang! November 1, Thursday, was our first Soirée Musicale, where many of our members share the music they have been practicing. There were solos, solos with piano, ensembles, classical music, jazz, pop, music played by beginners, novice players, intermediate players and our more advanced players! Relaxed atmosphere with tables and munchies! Our next Soiree will be in March. Stay Tuned! Both the band and the string ensemble had successful summer sessions! 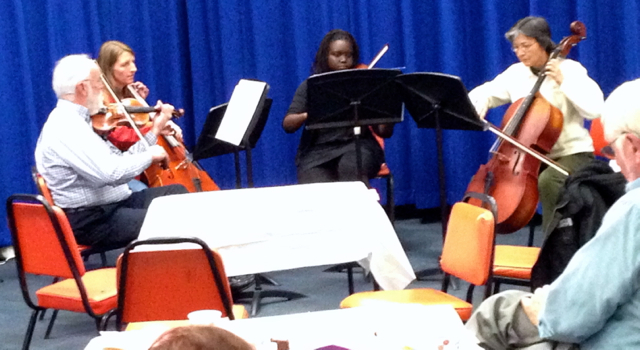 The strings played some new music and ended with a concert at Traditions of Wayland. 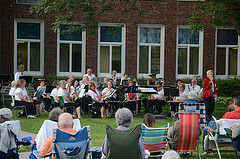 The band did one new piece and several from our permanent folder and play for 3 Senior Living Communities and on July 5th, the band again played as part of the Wayland Council on Aging’s Summer Community Concert Series. We try to get out frequently to play for Senior Living communities. These audiences are some of our best! Family and friends are welcome to join us for these very special performances. Those who have played the instrument before are welcome to join anytime, no matter how rusty you are (we will help you get back in the saddle!). If you want to start a new instrument with us, contact Diane. Beginner classes start in the fall. Be brave; it is never too late!!! Our December concert went quite well. The recording of our December 2nd concert is posted. The recordings and a link to concert photos can be found below. 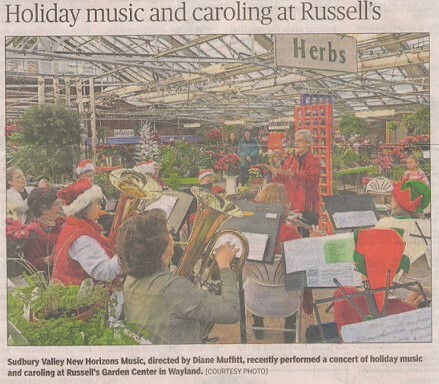 About 15 of us played Christmas Carols among the poinsettias at Russell's Garden Center. Great fun! Many children (and their parents) stopped by to sing and play the jingle bells with us. We played Jingle Bells about 10 times! Register on-line through the Wayland Recreation Department. Or you may download a registration form and either send it in to the Rec Department, or bring it to the first rehearsal. If you are a new member, I recommend you try us out for a couple of rehearsals before you sign up. email Diane for more information. Our next beginner classes start in the fall, should you be interested in starting an instrument or learning a new instrument (band or orchestra instruments only, sorry, not piano nor guitar). Please contact Diane if you are interested in starting a new instrument at a different time of the year. Wednesday evening rehearsals Intermediate Band and Strings, & beginner band and string classes, at Wayland Middle School. Most people arrive around 6:15; rehearsal begins 6:40. *Band members may come to either Monday afternoon or Wednesday evening OR BOTH. If you are not a regular at the Monday rehearsals, do check in with Diane to be sure there will be space for you - it is a small room! We have had two or three Soirée Musicale performance nights each year, since we started having these events in 2014. The very popular Soirées are a time for our members to show off what they've been working on--solo or ensemble--in a safe and supportive environment. Each Soirée has had sharing by our beginners & novice players as well as our intermediate and more advanced players, playing a wide variety of musical styles. We transform the the Large Hearing Room at the Wayland Town Building into quite a nice venue with small tables, white table clothes, candles and refreshments. After our first Soirée, participants reported that the atmosphere was supportive and that they loved taking part and they requested that we do more than one per year! Below are pix from the first Soirée Musicale. *Concerts are not required for our members and there is no pressure to do them. Generally when we go out to play in other venues, we have from 30-40 members who attend. What? No clue what those little black marks are on the paper? We will teach you! Contact Diane. So true! Talk about in the moment! Do you worry about your job or anything else while playing?? Great article from the NYT about conducting and what is going on as we wave our arms around. Be sure to look at the video, too. Fascinating use of technology! I've posted an theory explanation of the "C, E & G walk into a bar..." joke. Go to the Musings page. I've added a "Musings" section to our website. I'm starting with that "Good Word", Opsimath. But, anyone else who has a musing of some sort that might be interesting to others in our group of opsimaths, is welcome to submit it.